Pictured above, Emma Wall (Writer/Director); Jo Halpin (Producer); Claire Byrne (DOP) make up the talented Alfonso Films who are behind the short PAT. Pat was funded by Bumble’s 2018 Female Film Force. Set in 1978, Pat tells the story of a mother who stays connected to her son in New York through the only phone in the village. PAT stars Rosaleen Linehan and Moe Dunford and was shot in Dingle in October 2018. Launched last year, Bumble Presents…The Female Film Force, is an initiative born out of a desire to encourage women to make the first move, stand up and tell their stories. 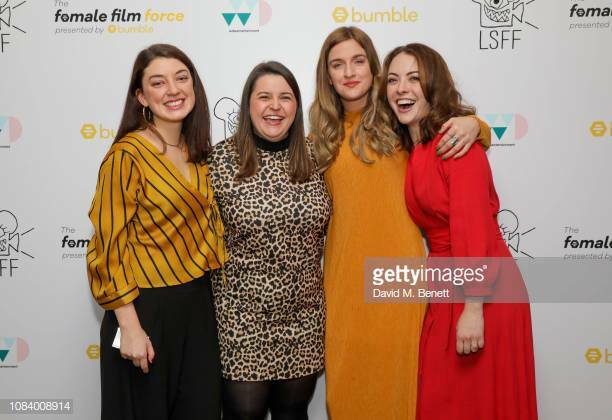 Bumble awarded five female filmmakers and their teams £20,000 each, giving them the opportunity to make a short film that embodies Bumble’s core value: kindness, respect, and equality. The five films funded shine a light on untold stories, debunk stereotypes, and empower female characters. They explore the experiences of women of all ages, races, and walks of life, risking it all for their families, heritages, and beliefs. The screening, in partnership with London Short Film Festival, took place at the Soho Hotel.